The Rocky Mountains are a western region of the United States of America, as well as a small section of Canada that offer skiing and snowboarding in the winter, and road and mountain biking, hiking, camping, kayaking, horse-back riding, and white water rafting in the summer. 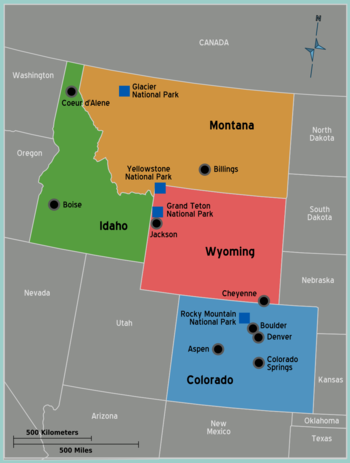 The Rockies also extend into northern New Mexico and north-central Utah (both however are considered part of the Southwest region), as well as northwest into Washington state. The Canadian Rockies are located in the Canadian provinces of Alberta and British Columbia north of the U.S. states of Washington, Idaho and Montana. The Rocky Mountains are huge: in length as well as height. Ranging over 3,000 mi (4828 km) from British Columbia to New Mexico, and reach as high as 14,440 ft (4,401 m) above sea level (Mt Elbert in Colorado). For the past four centuries, visitors have come to encounter from the long flat plains in the east to the shocking and iconic wall of the Front Range just east of the continental divide—the Cheyenne aptly called the mountains, "Rock on the Horizon." Wildlife viewing comes in all sizes in the Rockies: A Whitelined Sphinx Hummingbird Moth sips nectar from a Columbine (the state flower of Colorado) in the White River National Forest. The largest and most popular entry point into the region is Denver, which is one of North America's principal rail and flight hubs. Domestic flights to the other major cities in the region, like Cheyenne, Boise, Billings, or Jackson, should be easy to find from any American hub airport. Route 25 is the major north-south highway, leading up from New Mexico, while I-70, I-80, and I-90/94 are the major east-west highways. Be aware that passes do get closed due to inclement weather (snow) in winter months, in particular I-70 is prone to this. Bus routes exist, mostly through Greyhound, but given the long distances, flying is often cheaper than paying for gas and bus fares on the road. Getting around the Rocky Mountains can be tough. Mountain passes freeze in the winter, as you might expect, and many roads are risky, if not impassable under heavy snow. Moreover, you'll run through more gas per mile in the high altitudes. Flying is often a very good alternative in the winter, since Denver offers flights straight to ski slopes off in the mountains, as well as to virtually all the cities in the region. During the warmer months, however, driving becomes a great way to explore the region. Some of the most spectacular drives in the country are located here among the high mountains and endless wilderness. It can also be the only way to get to destinations off the beaten path, since, as you might expect, there's not a lot of public transportation in this vast and lightly populated section of the country. there is a lot of snow so you have to be careful when you walk around. The sights here are not urban in the slightest. With the exception of Denver, there are no really large metropolis. Wyoming has less people than Alaska, and is proudly America's least populated state! Colorado boasts the highest overall elevation in the USA. Come here to admire the wildlife and spectacular vistas in the National Parks. 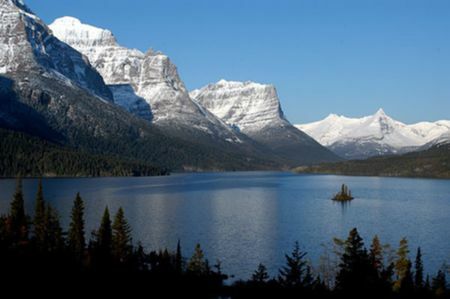 Many of North America's most renowned parks are here, from the geysers of Yellowstone, to the glaciers in Montana, to elk and bighorn sheep wandering among the high peaks of Rocky Mountain National Park. Black and Grizzly bears, wild cats, and buffalo are also found in the region. Also of interest are the old mining and cowboy frontier towns that once comprised of most of the region's population. Many old gold mine towns have transformed themselves into a tourist economy destination, with tours leading right down into old gold mines. The cowboy towns remain, however, and that way of life has not yet died out. A good example is Leadville, Colorado. In addition, regional cultures including the indigenous Hispanic and American Indian populations, add long and proud heritages to the mix. Outdoor adventure is the entree on the Rocky Mountain platter. There's wonderful hiking just about everywhere, from the ravines in the plains in the east, to canyons in the west, to the high mountain trails along the Rocky Mountains spine. Trails are managed by the National Park service, State Park services, and National Forest and Grasslands services. Camping is widely available throughout all the wilderness regions of the Rocky Mountain states. Outside of the National Parks, it's not even regulated—you can just drive into any national forest and pitch a tent wherever your fancy. Hunting and fishing is regulated heavily by the Department of Fish and Wildlife, to protect local fauna from over hunting, but the activities are widely practiced, and you'll have some beautiful areas in which to enjoy them. The biggest draw to the region, without a doubt, is the fantastic downhill winter sports. Ski resorts like Aspen and Vail rank among the world's finest, and are priced accordingly. But there's a wealth of other more affordable, and still fantastic options. The ski season in the Rockies starts early in the late Fall, and lasts long until the late Spring. The snow quality is magnificent, and the weather usually surprises with how warm it can be. Sporting events are not quite so widely available as you would find in other parts of the country (simply because there are fewer big cities here), but Denver makes up for that, with a lively sports culture, and one great football team, the Denver Broncos. If you're interested in the cowboy culture of the Rockies, look for a rodeo—especially away from the ski resorts and the biggest national parks, they're not half as touristy as you might suspect. You can find great food in the Rocky Mountains if you know where to look for it. 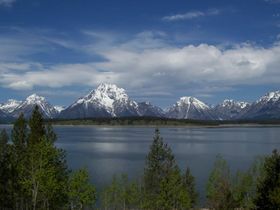 Given the vastness of the region, fine dining is generally concentrated in urban areas like Denver, college towns like Laramie or Boulder, the fine old lodges in the most popular National Parks like Yellowstone and the Grand Tetons, as well as the end-destination ski resorts like Jackson Hole, Aspen, Telluride and Vail. Fast food, chain restaurants, diners and bars and grills are the norm for the majority of the Rockies. Throughout the countryside, you'll be pretty much limited to small places with plenty of character, but also the same old dishes — hamburgers and steak are staples here. It is, however, a very good place to add elk and bison to the list of animals you have consumed. Drinking, on the other hand, is a time honored activity in the Rockies, and it is done well. Colorado in particular is home to an enormous quantity of microbreweries, and you'll never be in want of good local beer throughout the region. Liquor laws are very lax compared to the rest of the country (in general, there are fewer laws out here), and you can often pick up some beers at a drive thru window! Denver and Colorado Springs have higher crime rates than the rest of the cities in the Rockies. In most other places you will not face concerns except in Wyoming where if you are LGBT you could face discrimination, vigilante beatings/attacks/torture and police will turn a blind eye or be complicit. No businesses are LGBT friendly If you are LGBT, keep your sexuality private in Wyoming. Outside of those cities, you're very unlikely to be the victim of crime in the Rockies. You do need to be vigilant about safety in the wilderness. Don't get too close to buffalo, who will charge your car if provoked (and the bulls can smash a car in two if they want to). Bears can smell food from great distances; Hang food in a bag suspended from a tree, far from your campsite so that bears do not harass you during the night. The winters are extremely cold—-make certain that someone knows where you are when you venture out, and where you plan to go. Always research the conditions in advance and prepare adequately. Many people die in avalanches and or even freeze to death in their vehicles every year. Lighting is the number one killer at high altitudes. Weather in the mountains changes without warning; Storms may form in less than 10 minutes. Make a point of registering with the local park service when embarking on a multi-day hike, so they know you're out there and have an idea of how to rescue you if that becomes necessary. Respect private property. If the sign reads no trespassing, it means no trespassing. Many rural residents, while usually friendly to outsiders, own firearms and may respond aggressively to intruders. The Rocky Mountain region is very involved in nature conservation and animal protection, so don't hunt out of season, don't shoot endangered animals, don't pollute and respect conservation and protected animals. You can get arrested by park rangers, or by word getting spread. The Rockies don't stop here, and there's an extraordinary wealth of high mountain trekking opportunities just west in Utah. If you're looking for more National Parks, but with a change of pace, head south into the Southwest for iconic red rock and desert parks. This is a usable article. It gives a good overview of the region, its sights, and how to get in, as well as links to the main destinations, whose articles are similarly well developed. An adventurous person could use this article, but please plunge forward and help it grow! 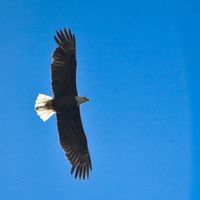 This page was last edited on 9 April 2019, at 07:47.